Looking for Package Deals to Cabo San Lucas? We have those too! Los Cabos has become one of the most sought after golf destinations in the world with its championship Dye, Nicklaus, and Jones ocean and desert layouts and world class tournaments. A tropical paradise with azure seas, warm sands, and soft breezes, Los Cabos is unequalled as a golf vacation haven and is popularly known as just “Los Cabos” in Mexico. A small city magnified by its splendor, located at the southern tip of the Baja Peninsula. Well known for its pristine beaches, this wonderful place has gradually developed into an alluring golf destination. A number of famous celebrities frequented here. Los Cabos is dubbed as natural wonderland where the Pacific Ocean and the Sea of Cortez flows together. Golf courses here are exceptional with challenging elevations and breathtaking scenery of the sea. Los Cabos is indeed a treasure of the Baja Peninsula. Home to two Senior Slams, and a host of other prestigious golf tournaments, the 6,988 yard Cabo Real Golf Course designed by Robert Trent Jones II has what is considered the toughest front nine in golf in Los Cabos. 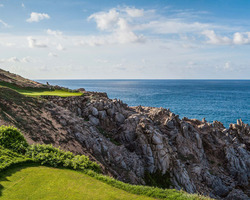 Its three spectacular ocean front holes put Cabo Real on the golf world map when whales put on a spectacular show breaching just yards offshore during the Senior Slam golf tournament. Long considered the favorite of many pros, the Cabo Real course is a must during any visit. Palmilla Golf Club, located in San Jose del Cabo, Mexico, has been rated as one of the top 100 in the world by Great Golf Resorts of the World. Palmilla features a signature Jack Nicklaus golf course and luxury accommodations with One&amp;Only Resorts. From towering cacti and deep arroyos to breathtaking views of the Sea of Cortez, the championship golf course at the Palmilla Golf Club offers challenges and delights. This luxury Los Cabos, Mexico golf course is divided into the Arroyo Nine, the Mountain Nine and the Ocean Nine. Five sets of staggered tee boxes, stunning fairways, four lakes and deep shifts in elevation ensure golfers of every skill level a memorable and exciting game. 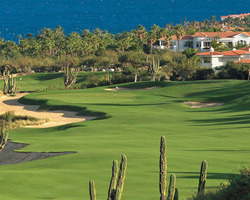 Discover a great Mexico golf vacation destination at Palmilla Golf Club in San Jose del Cabo.